I got the book from Hervanta library as a quick loan and read it in a week. The translation to Finnish is atrociously bad (silicon is not the same as silicone and similar other obvious translation mistakes) as Aleksi Moisio noted on his review of the book in Helsingin Sanomat. However, if these problems are overlooked, the book itself was ok. 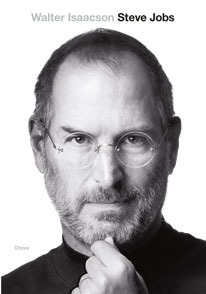 While it was interesting to read about Steve's life and how he did things, his personal traits as portrayed by the book didn't come as a surprise. I appreciated the interview snippets of Bill Gates and Jobs' relatives, and the description of the last years of his life during his sickness. Sign into Goodreads to see if any of your friends have read Steve Jobs.